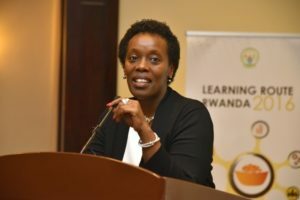 Monday 1st November 2016, Serena Hotel – The first Learning Route for Scaling Up Nutrition Civil Society Alliances in Africa was launched at Serena Hotel in Kigali. Hosted by SUN Alliance Rwanda with support from SUN Civil Society Network and PROCASUR Corporation, the event which runs till the 5th November, was given its full support by both Ministers of Health and Local Government as a worthy initiative to capacitate civil society in contributing to the fight against malnutrition. Addressing over 150 stakeholders from government, civil society, UN Agencies, donors, media and delegates from 8 African countries from Nigeria, Sierra Leone, Ethiopia, Malawi, Tanzania, Zimbabwe, Kenya and Uganda, Hon Minister Diane Gashumba thanked SUN Alliance Rwanda for bringing this innovative learning approach to Rwanda. Acknowledging strides made in addressing malnutrition where exclusive breastfeeding rates have increased to 87.3 percent and wasting rates reduced to 2.2 percent, Mdm. Gashumba stated that much needed to be done to reduce stunting rates in children under five currently at 38 percent. She assured continued political commitment as the government works towards tackling poor nutrition and urged for stronger coordination in galvanizing various stakeholders to contribute to improving nutrition through multisectoral partnership. In his welcome address, Butera John Mugabe, Coordinator for SUN Alliance Rwanda urged civil society partners to learn from each other in order to build their capacity to tackle the problem of malnutrition a serious cause for concern in Africa. Ending malnutrition in all its forms is one of the challenges set by world leaders when the Sustainable Development Goals was adopted in 2015. According to the Global Nutrition Report 2016, it is estimated that 45 percent of deaths of children under 5 are linked to malnutrition and the economic consequences amount to losses of 10 percent of gross domestic product (GDP). These losses put considerable strain on the global economy, which is being tested by the ever-changing social and economic climate. The value of this approach was further reinforced by Giulia Pedone, Methodological Coordinator of PROCASUR Corporation through examples of how this tool had been used to facilitate social change by tackling global challenges through various rural development projects. More investment in nutrition was the clarion call from government and civil society alliances from the 8 countries, in recognition of the overall impact of better nutrition for a better world. In response to this, Brie O’Keefe of Children Investment Fund Foundation (CIFF) acknowledged that, “all children deserve to survive and thrive”. As part of their principle CIFF invests in problem solving. Nutrition is an area where CIFF is investing with specific focus on stunting and wasting. By providing funds to sustainable movements such as civil society CIFF is assured they will be able to reach the most vulnerable at the local level thereby contributing to improving nutrition outcomes. On the 31st of October 2016, during the SUN Civil Society Learning Route Opening Ceremony, 9 SUN Civil Society alliances from Ethiopia, Kenya, Malawi, Nigeria, Rwanda, Sierra Leone, Uganda, Zimbabwe, Tanzania raised their CALL TO ACTION for national and international Policy Makers, National and International Agencies that play can accelerate and potentiate the fight against malnutrition. 1) Co-ordinate Nutrition Plans: Position nutrition at the highest level of government and bring together stakeholders from across government, the private sector, civil society, donor and UN networks to develop coordinated and costed nutrition plans both at a national and subnational level. 2) Resource Allocation: Ensure national nutrition plans are fully funded. Spending on nutrition should be prioritised and national budgets must include specific nutrition budget lines to turn plans from a piece of paper into a reality. Key to this is the timely release and proper utilisation of funds. 3) Community engagement and accountability: Ensure nutrition interventions are transparent and involve the communities most affected by malnutrition. Nutrition plans must reflect the realities of communities, respect communities as implementation partners and enable communities to track progress and hold governments accountable to their commitments.